Shell Station is a filling station providing petrol, diesel, food, snacks, car accessories and other supplies. Based in Newnham Road, Cambridge, Shell Station is a business. 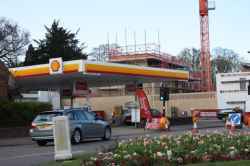 Shell Station is in Newnham Road Cambridge. You can view a list of neighbouring businesses by going to the Newnham Road page. If you would like a list of other petrol filling stations shops & other retail outlets listings throughout Cambridge, please visit the Petrol Filling Stations section of this website. Note: the pin is positioned at the postcode centre, and may not correspond with the precise location of Newnham Road.